A few things happened last week that have me thinking about balance in our literary classrooms. The first thing was the book fair. Kids came back with books. Graphic novels, nonfiction, chapter books all of their choosing. Books that aren’t in my library. Some might not have been on their level. The second thing was a decision to open up the first 15 minutes of the day to pure choice, reading or writing. Before that,”the first 15″ was an opportunity to blog or write in their writing notebooks, whatever they wanted to write. But after some conversations and thought, I decided to open up the choice to reading or writing. These two things created excitement, disbelief, and questions. You mean I can read anything? Can I write about reading? Once the choice was understood, the silence was deafening. All were deep into what they had chosen. I saw this passion and agency surface again during our weekly reading recommendations when students recommend their “5-star” books. I love this time when students get to stand up for books they love. Today, T got up to recommend The Crossover and the room lit up. I have five copies of this book, and they have been passed around like crazy. T could hardly get her recommendation out without comments flooding her talk. N: It reads like rap. P: But it’s really like poetry. A: And and a girlfriend. G: Ooh. Let me feel it. M: It’s written like Home of the Brave. This is the real deal. Complete student-led choice and engagement. It can’t always be this way. Nor should it be. Students have “choice” within units of study that revolve around goals and genres. Interpretation and analysis of nonfiction, realistic fiction, historical fiction, fantasy, poetry. This is hard literary work, where teachers nudge students’ brains and hearts toward these goals with read aloud and mini-lessons; with book club discussions and conferences. This is necessary and important work that builds engagement in an academic and thoughtful construct. But today I’m thinking about balanced literacy in a way that offers kids a balance of goal driven work with space and place for agency. I’m thinking about the room we need to make in our classrooms for student-led engagement in literacy. Times without checklists or units or expectations. Times when students just light up with the opportunity to read, write and talk about books without constraint. This is necessary and important work that creates readers who will live on outside the classroom in a culture they own. . Thank you, Anna, Betsy, Beth, Dana, Deb, Kathleen, Stacey and Tara for a place to share our lives. 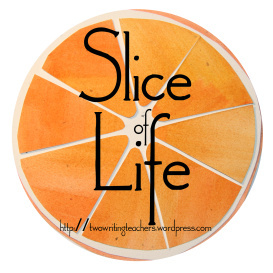 Read more Slices of Life here. What a wonderful, rich slice of conversation from your classroom! I LOVE the idea of weekly reading recommendations and am already trying to figure out how to incorporate that in my first grade classroom. Thanks for sharing! Thank you for this post! I just sent it to a colleague. He and I were chatting at the copier last week a little frustrated that we know our Reading Workshop can be stronger but our district is distracting us by asking us to pilot a reading program and it is no where near as rich as the work of TCRWP that we are both more familiar with. We needed your clear voice to be reminded of why we want to teach with rich resources…for the kids. Thanks to you I am feeling stronger to stand up for my kids and teach using the best resources I know and not what is suggested. Somehow holding off on this choice time made it that much more enticing for the kids. They were ready to make the choice and feel empowered by it. I love hearing book talks too and this year I have been more consistent about this. When last week I had not put up a new sign up for more book talks I was gently reminded by students. It is great to see them do what they love. I think the fundamentals and art of writing needs to be balanced with the exposure to writing. Good for you for giving your students the time to read. It is part of the equation. I love the idea of choice! We are having kids use the first 15 to read… but a lot of the kids end up reading consistently choosing books well below their level, and I’m getting a bit frustrated about the productiveness of this time. Thanks for sharing! Thank you for writing this post – it just what we needed. The nudge to keep writing our next piece — levels, rubrics, strategies are tools to help us teach and engage our learners not restrict and disengage them. Love hearing about the excitement, Julieanne. Choice is the key word at the school where I taught, as I’ve shared before. The engagement from five to fourteen is evident. They take on the learning and thrive. I’m interested to hear where you’ll go next? Allowing choice seems to be a roadblock for many teachers. I love the way you laid out that there are times total free choice is not always an option, but there are places within the curriculum that allows for some choice. How I would have loved starting the day with fifteen minutes of free reading as a student. I get so disappointed that students leave the book fair with trinkets and not books. Glad your kids were bringing books back into the classroom. This post about choice is one of the best I’ve read on the topic in a long time. You’re giving all of us important things to think about, Julieanne. How wonderful that must feel for you! Julieanne, this is the truest, best definition of ‘balanced literacy’ I’ve heard. This is exactly why choice matters. You articulated it so well. I’m a former middle school teacher, and I often think about going back because I miss it so so much. If I ever did, I’d totally do this as their “Do Now” each day. Love the idea, love the balance of purely, authentic choice, since their choice in our our literacy work is a little more limited. Thank you for sharing! Choice is so important and this is exactly the reason why. Wonderful post. Do you think something’s in the air? You, Tara & Fran all wrote such wonderful slices this week that seem, in one way or another, to all be about getting real. And this one seems so important. Makes me want to sit down talk with you over a glass of wine about the purpose and impact of goals. If we give kids cognitive choice in the book clubs and or read alouds—as in choice about what and how to think—do you think we’d naturally meet those goals, within making such a big deal about goals? I so want to think so. Love this! We are in between writing genres now – and my kids are free writing: creating everything from comic books to sci fi stories. Choice is where agency lies.